Documents available to P2P-Banking.com show that German p2p lending service Auxmoney raised a series A round in the end of 2012 from 2 companies. The new investors now hold 21.8% of the shares, the 3 founders Philip Kamp, Raffael Johnen and Philipp Kriependorf hold 40.4% of the shares and the remainder is held by various seed investors (mainly from Austria and UK). The volume of the Series A round was not disclosed. In fact the round itself was not announced in public. Yesterday Auxmoney did change its business model. In the past Auxmoney approach was subject to continued criticism (see also), because Auxmoneys largest fee income came from listing fees that every applicant for a loan had to pay. And with 80-90% of applications not funded, many critics felt that this model was unfair to the borrowers. Since yesterday Auxmoney charges borrowers a transaction fee for funded loan applications, but no more listing fees. This is in line with fee structures used by most major p2p lending services. Lenders pay a 1% transaction fee on successful bids. In the past Auxmoney used a mix of loan listings that closed when they reached 100% funding and loans with reverse dutch auctions. In future all loan listings run for a maximum of 20 days and close immediately when they reach 100% funding. Raffael Johnen, co-founder of Auxmoney told P2P-Banking.com: ‘Lenders told us, that when they had bidded, they wanted to be sure to have invested in the loan part and disliked when they were outbid in the course of the auction‘. Auxmoney also redid parts of the user interface and the dashboard for lenders. Johnen promised faster and more transparent information from the collection process. My expectation is that Auxmoney will use the funds raised to expand its marketing efforts which have already yielded visible results when Auxmoney started to waive some listing fees in the end of 2012. 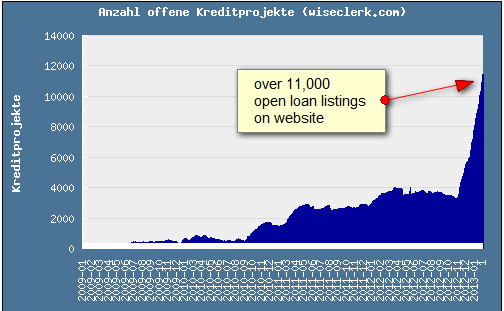 As the above chart shows there are more than 11,000 open loan applications listed right now on Auxmoney.com. This figure will decrease, since with the change of the model the maximum listing duration decreases from 90 to 20 days. But it is still a huge selection. However the quality of listings is very mixed as Auxmoney does not verify information (e.g. employment, income) provided by the borrower. 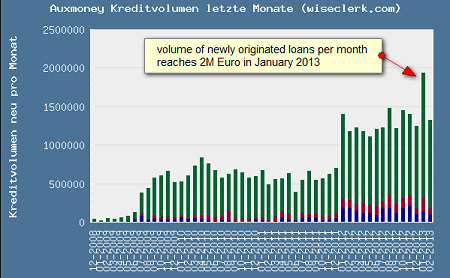 Only about 10-20% of loan applications are funded and therefore the growth of the loan volume is not as steep.